Glasshouse Inventory provides an exhaustive inventory reconciliation service. I signed up for Glasshouse Inventory’s service mid-2016. I even had them go back into 2015 to see if there were any reimbursements that I had missed. I even thought so highly of Ashley, the principle of Glasshouse Inventory, that I was happy to have her present at ResellingDO3. At the time I signed up, I had gotten what was really a sweetheart of a deal, I think I was paying as little as $35 a month. Others were paying anywhere from $25-100 a month. I opted to stay on, as I was curious to see how everything would work out. Here was my response. I received a response that essentially said that the lower subscription was a “beta testing phase” and the company had progressed. I get it, you have to make money. This e-mail was sent February 6. Message received, loud and clear. But I still held through for a week. Then, a week later, I had still not received an invitation to my new dashboard. I sent my message expressing my decision to change course. I received a response fairly quickly, directly from Ashley. We will send an email when we’re finished with a record of your cases and reimbursements to explain your January bill and finish your services for that month so you can find an alternative going forward. Ashley responded with what I thought was perfectly reasonable. She answered my questions. Great! I expected this, and I had seen a couple of reimbursements come through, but the number seemed a bit high. So, I go to the link, then download the excel of the invoice, expecting to see, as Ashley had assured me I would see – a record of your cases and reimbursements to explain your January bill. What did I see? Now, I don’t know about you, but that does not look like a list of all the cases and reimbursements. So, I logically sent an e-mail back–in fact, I sent two e-mails back, because I felt I might have been too harsh in my first response. As of yet, I have not received any response, but the last bit of this did transpire over the weekend. Unfortunately to the best that I can find in my e-mail (and I had to search through it to get all of those screenshots), Glasshouse Inventory didn’t deliver. 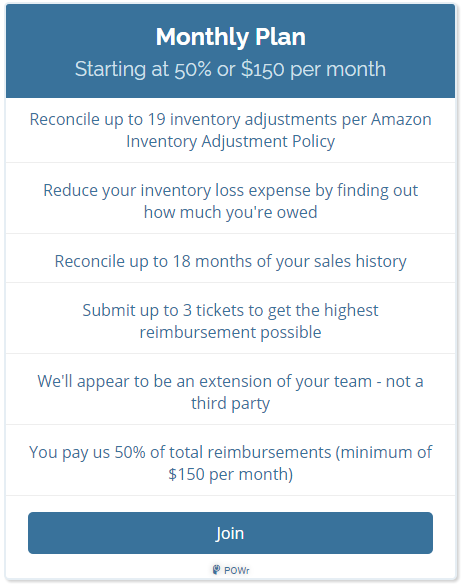 Like I said, I get it, a growing company can encounter growing pains, but, logically, anyone would realize that when you’re telling your customer that you are going to charge them more, you want to back that up, right? I think the part that frustrates me the most is the lack of following through on promises. But, as I sit back and think about it, I can only imagine how many of the other “beta testers” feel. Glasshouse Inventory clearly cut their teeth on many of us smaller resellers, I dare say, many folks in the miles and points community, and to receive this caliber of treatment, is a shame. Have you worked with Glasshouse Inventory? What was your experience? To be honest, I haven’t yet decided whether or not to sue. Because the “value” I got for my money was laughable, the idea that a contract can be cancelled at whim by one of the parties is just plain WRONG, and the terrible execution of that terrible idea leads me to believe that in the end, Ashley and company are utterly uninterested in their reputation in the marketplace. I need to figure out if I, too, received too little of a refund. Probably, right? This whole affair is a case study in how NOT to run a business.